Vancouver, B.C… Corvus Gold Inc. (“Corvus” or the “Company”) - (TSX: KOR, OTCQX: CORVF) announces the final assay results from the last 10 core holes drilled during the 2013 campaign at its 100% controlled North Bullfrog Project in Nevada. Exceptional high-grade results from the northernmost holes in the Yellowjacket vein system include: NB-13-372, a step out of 89 metres along strike from NB-13-370, with 27.8 metres @ 2.9 g/t gold, including 3.3 metres @ 3.9 g/t gold and 33.3 g/t silver, and NB-13-369, a step out of an additional 41 metres along strike from NB-13-372, with 37 metres @ 3.2 g/t gold including 12.9 metres @ 4.1 g/t gold and 60.6 g/t silver (Table 1, Figure 1). The Yellowjacket system now has a drill defined strike of nearly 800 metres and remains open to the north and at depth (Figure 1). Hole NB-13-370 returned the deepest intersection to date on the Yellowjacket system (170 metres down dip), which has shown a marked increase in the grade of the system. The vein/stockwork intercept in this hole was 41.7 metres @ 4.9 g/t gold and 29.7 g/t silver, including 4.9 metres of 21.2 g/t gold and 117 g/t silver, surrounded by over 60 metres of disseminated low-grade gold-silver mineralization. The hole terminated in mineralization. This drill intercept is 125 metres down dip from the intersection in NB-13-358 (24 metres @ 1.3 g/t gold) and 73 metres down dip from NB-13-359 (65 metres @ 3 g/t gold), both of which were reported in NR13- 32, December 5, 2013). This new deeper hole opens up significant potential to extend the depth of the deposit into what appears to be a higher grade portion of the system. An important geological feature, called the NE30 fault, intersects the Yellowjacket vein in this northern area. The fault is mineralized and, as it approaches the Yellowjacket vein structure, a thick zone of stockwork is developed between the structures as indicated by the thickness of peripheral stockwork in the hangingwall of the vein zone in hole NB-13-370 (60 metres @ 0.37 g/t gold, Table 1). Hole NB-13-371, with 10 metres of 0.63 g/t gold, was drilled to confirm the location of this structural zone so it can be targeted for future high-grade veins outboard of the main Yellowjacket. The NE30 structure is consistently mineralized in holes 369, 370, 371 and 372, forming a large target (Table 1). At North Sierra Blanca, hole NB-13-375 returned 138 metres of oxide material averaging 0.26 g/t gold, thereby continuing to expand the bulk tonnage deposit and improve the confidence in the results to date. In addition, high silver intersections in hole NB-13-376 and the bottom of hole NB-13-375 have emerged as future targets for more Yellowjacket type veins at depth. Holes NB-13-362 and NB-13-363 are PQ diameter holes drilled in the Yellowjacket deposit to confirm continuity of high-grades in larger diameter core and to acquire material for coarse crush metallurgical testing. Hole NB-13-362, with 35 metres of 4.0 g/t gold, was drilled in the center of four holes (NB-13-353, 354, 355 and 356) and has returned a similar average grade and thickness as the 4 surrounding holes. Hole NB-13-363, with 19 metres @ 3.4 g/t gold, is the twin of hole NB-12-347 which reported 14 metres @ 7.1 g/t gold. The consistency of the zone thickness is good and the variations in the grade reflect the typical variability associated with high-grade gold and silver systems and are encouraging in establishing continuity of grade with larger diameter core. *Intercepts calculated at a 0.1g/t gold cutoff and with up to 1 metre of internal waste. Three core holes were drilled on the crest of Sierra Blanca North to evaluate quartz stockwork mineralization found in RC holes NB-13-242 and 246 (41m @ 0.7 g/t gold and 21m @ 0.5 g/t gold). Core hole NB-13-373 undercut hole NB-13-242 and returned an interval of 17 metres of 0.58 g/t gold inside of an overall intercept of 78 metres of 0.26 g/t gold, establishing the continuity of the zone (Table 2). The difference in the thickness of the higher grade zone reflects a less oblique angle of intersection in the angled core hole compared to the vertical RC holes. 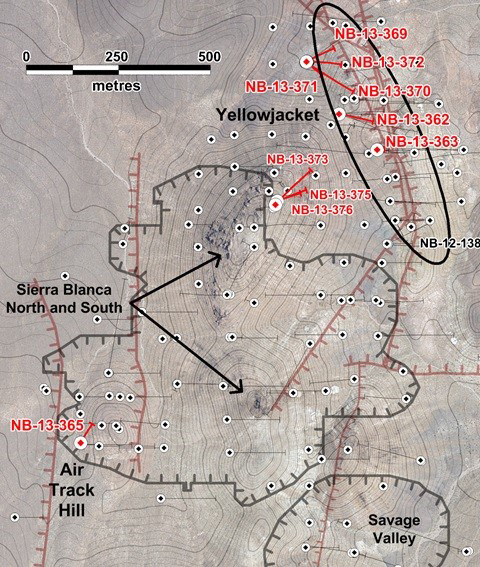 Hole NB-13-375, with 138 metres @ 0.26 g/t gold, was designed to test the stockwork and define the location of a key fault along the north-easterly flank of Sierra Blanca North. Hole NB-13-376 was drilled to establish the location of the NE40 fault and confirmed that it is mineralized, thereby outlining a deeper exploration target for potential high-grade veins for the 2014 program. Hole NB-13-365, drilled at Air Track Hill to follow up the high tellurium mineralization found in the area, encountered the tellurium enriched structure but with only moderately anomalous gold grades. The hole will help define the orientation of the structure that hosts the tellurium-rich gold mineralization in hole NB-13-364 (NR14-01, January 9, 2014). Table 2: Significant intercepts* from recent core holes at North Sierra Blanca. Figure 1: Location of drill hole discussed in this news release. Red collars and traces indicate holes reported in this news release. Blue indicates holes for which assays are pending. Black indicates previously released results. Significant mineralized faults are shown in dark red. Grey hachured lines show outlines of present proposed pit designs. Topographic contour interval is 2 metres.